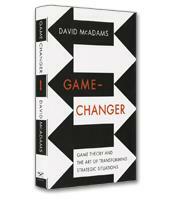 McAdams uses game-theory to design a radically new and easy-to-learn way to outstrategize your rivals. He develops six basic ways to change games: commitment, regulation, cartelization, retaliation, trust and relationships. By learning to be a deeper strategic thinker, you’ll be able to recognize how to “change the game” to your advantage. How game theory informs everything from business to politics and more. The benefits of using game theory to plot business tactics and gain insights. The five key strategies for solving the Prisoners’ Dilemma and how to use them in business.